Two of the pieces I admired at the Sotheby’s Fine Jewels auction preview last weekend were an amazing Verdura “Blackamoor” brooch and a huge emerald and diamond ring by Repossi. The lovely associate who showed me both pieces told me they were from the collection of the romance writer Danielle Steel! I know Danielle Steel is petite in physical stature, but she certainly likes big jewelry! The Blackamoor was just stunning, and so big, and featured a falcon on the man’s shoulder to boot. The seed pearls you see in his turban and at the neck go all the way around the brooch to the back. It is quite heavy and would require a substantial fabric to be clipped to. It is made of rubellite, diamonds, seed pearls, onyx, and enamel. The feather on the falcon’s head is carved ruby! A crazy big emerald ring by Repossi. 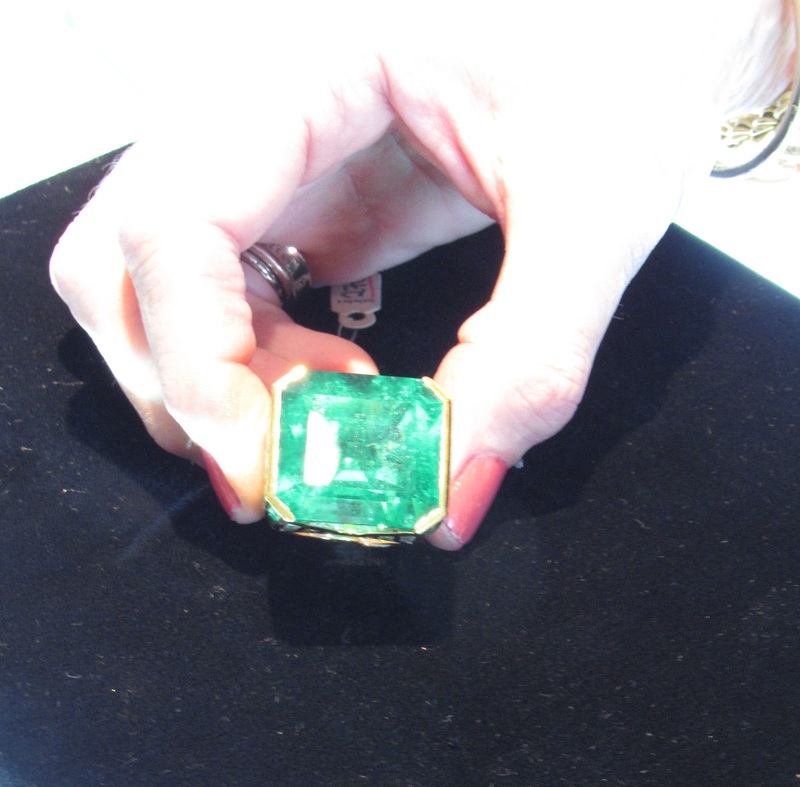 As for the emerald and diamond Repossi ring, check out that center stone: the emerald is 80 carats! The ring is size 6, the same size I wear, and I attempted to put it on but I was so worried it might get stuck that I stopped before going past the knuckle because that is not the kind of ring that would come off easily if it’s too tight. It is accented on the sides by emeralds and diamonds. The side of the ring. It is quite tall. A girl of about six or seven, who was there with her grandmother and was wearing a gray leopard print fur vest, asked to see the ring, which was just adorable, but she, like me, was too skittish to try it on! The associate said, “Some rings are too big for small hands, aren’t they?” and the girl agreed. She did admire the size and color of the stone, which was a vivid green. When her father came over to see what she and his mother were looking at, I think he got a kick out of the fact that his daughter had picked out the biggest ring in the case to see up close. The associate told him she had great taste! The photo of Danielle featured in the catalog. By Brigitte Lacombe. It’s always a treat to spend time with fine jewelry, especially vintage, and particularly when it comes from the collection of someone I have admired since high school. There were other pieces from Danielle’s collection on display from Michele della Valle and David Webb so it seems she is editing her jewelry wardrobe. That is another aspect of collecting that is interesting to me—if it’s not about selling something just to raise cash, what prompts someone to sell certain pieces and how do they know the time has come for them to do so? If you have any thoughts on the topic leave them in the comments below. And let me know what you think of the brooch and ring! 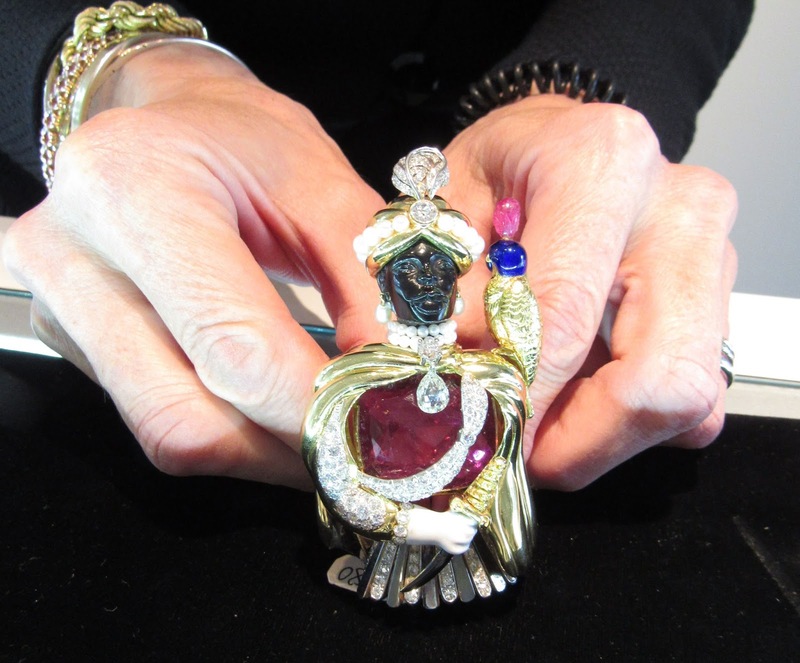 The brooch did not sell at the auction, but the ring went for $225,000, which is the hammer price plus buyer’s premium. Interesting. There are many different reasons why jewelry pieces are sold when its not a monetary reason. You can just grow bored of it, the piece doesn't go with your current lifestyle, doesn't hold good memories, etc. Sometimes, what was in style just simply goes out of fashion. The pin you highlighted just seems too big & to me - dated. The emerald ring, beautiful, but would just overwhelm most women. Pearls were very popular for a very long time. Particularly, in the 1920's (thanks Chanel). In the 1950's just about every female, young or old, seem to own a least one strand of pearls - real or faux. The 60's brought a decline in the love of pearls & stayed that way for quite a few decades. Now it seems women are loving them again. I certainly do. Hi Rosie, yes you are probably right about why people sell jewelry. The emerald ring sold for so much money and I cannot overstate how big it is. I think it is one of the biggest rings I have ever seen in terms of width AND height! I wonder if the person who bought it wants to reset that emerald, it would be gorgeous as a pendant. 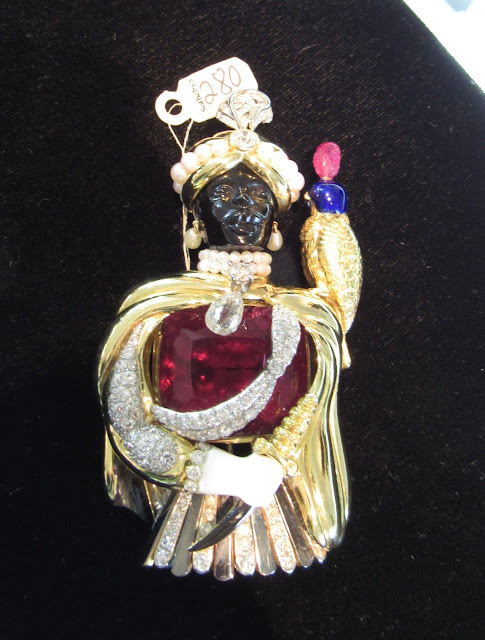 The Verdura brooch did not sell but if Danielle wants to pass it along to me I would wear it in a heartbeat, it doesn't seem dated to me, I love this elegant gentleman and his falcon lol. I don't see pearls on others as much as I'd like to, mainly pearl studs on the young people, but that is nice since they are a classic and look good on everyone.